One of my favorite feelings I get when reviewing toys is the flashback from my own childhood. For some reason I love seeing toys and remembering the gazillion years ago that I played with toys. There is actually a museum in Philly called The Please Touch Museum where they have cases filled with toys from the 'good old days'. You know what I'm talking about, right? Like Pogo Balls, My Little Pony, Gem and even the old 'boxed' Nintendo rocked my world as a kid. But now as an adult the old fashioned toys that we once spent hours on end with are so hard to find. Needless to say-you know how excited I was when I was watching Nickelodeon with my kid and saw the commercials for Gak & Floam and its return! Awesomeness! 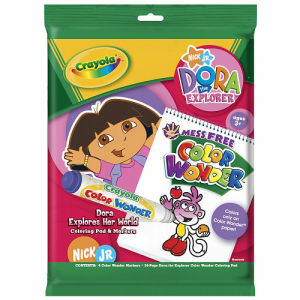 But when Nickelodeon sent me some Gak & Floam to play with I knew it was gonna rock out! Floam is my favorite. I have to admit. It's probably because there is more fun to be make with it. Gak on the other hand? Well...it's just that. GAK. Goo. Ugh. Ew. I love what the Urban Dictionary has for the definition of Gak. 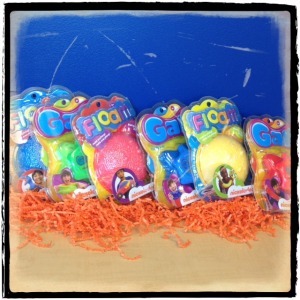 A popular Nickolodeon slime, available in many variations such as glow in the dark, speckled, cocoanut smelling, etc. Useful for making fart noises, grossing out friends. Me personally? I like to sniff it. And make fart sounds. What? Me, immature? Well...sometimes. Shhh. Don't tell anyone. It's just me being a kid again. You should join me. It's kinda fun. 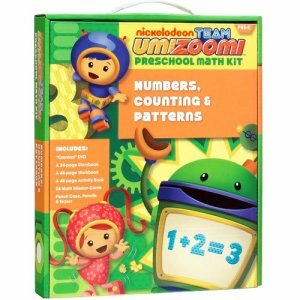 Developed by a team of early childhood experts, this Team Umizoomi Preschool Math Kit is packed with engaging and educational content that can help prepare your child for kindergarten and beyong! A "Carnival" episode DVD that introduces a high-stakes math mission. A 24-page "Carnival" storybook that invites your child to join Team Umizoomi on a Math Adventure. A 48-page Mighty Math Activity Book reinforces math skills in a playful way. A 48-page "Numbers, Counting and Paterns at the Carnival" workbook gives your child lots of opportunites to master what they've learned. Team Umizoomi pencil case, pencils and eraser included! A great deal for $19.99!